The ENVIROMUX® Environment Monitoring System (EMS) with 1-Wire Sensor Interface monitors critical environmental conditions, such as temperature, humidity, liquid water presence, power, intrusion, and smoke. When a sensor goes out of range of a configurable threshold, the system will notify you via email, web page, network management (SNMP), and/or SMS messages (via email-to-SMS). The IoT system supports 24 single reading 1-wire sensors in any combination – temperature, humidity, dew point, thermocouple or digital inputs – and 2 separate digital inputs. Also known as: Remote IoT 1-wire environment monitoring system, EMS, monitor networking closets, server room alert, IP temperature humidity sensor, web enabled thermostat, Internet of Things thermometer alarm logger. Monitor and manage environmental and security conditions over IP. 2 digital inputs sensitive to contact closure. 2 RJ11 6P4C connectors for daisy-chaining 1-wire temperature/humidity/dew point, thermocouple, or digital input expanders in any combination. Up to 24 temperature, thermocouple, or any single reading 1-wire sensor can be connected between both RJ11 connectors. Up to 8 temperature/humidity/dew point combination 1-wire sensors can be connected between both RJ11 connectors. Each temperature/humidity/dew point sensor is equivalent to 3 single reading sensors. Up to 12 E-DI2-1W digital input expanders can be connected between both RJ11 connectors to allow a maximum of 24 additional digital inputs. Each E-DI2-1W is equivalent to 2 single reading sensors. Maximum cable length supported on each connector is up to 600ft (183 m) depending on the configuration and number of connected sensors. Use RJ11 splitters (RJ11-3JCK) to daisy-chain 1-wire sensors (sold separately). The sensors will automatically be detected on power up or a Detect Devices button on the summary page can be selected when logged into the unit. Monitors (ping) up to 4 IP network devices - alerts are sent if devices are not responding. Sensor conditions can be configured to trigger alerts by themselves, and/or be used in combination with other alerts to trigger one Smart Alert. Supports 4 IP network video cameras for live view of any facility. Create multiple alerts for any installed sensor. Configure up to 32 alerts, and one Smart Alert. Dual redundant power supplies for connection to two separate power sources. The second power supply is sold separately. Available with optional Power over Ethernet (POE). The unit can be polled via SNMP. Optional intuitive graphical management software provides an easy-to-use, unified interface for both monitoring and configuring up to 3,000 ENVIROMUX units and all connected sensors. Security: HTTPS, SSLv3, AES 256-bit encryption, 16-character username/password authentication, user account restricted access rights. Ideal for a wide range of applications including IT infrastructure monitoring, cold storage/freezer monitoring, or any unmanned area that needs to be monitored. Two RJ11 6P4C jacks for daisy-chaining 1-wire temperature/humidity/dew point, thermocouple, or digital input expanders in any combination. Up to 24 temperature, thermocouple, or any single reading 1-wire sensor can be split between both RJ11 connectors. This maximum includes the cable length of each sensor. RJ11 splitters or t-tap boards (RJ11-3JCK) for daisy-chaining sensors are sold separately. Two screw terminal pairs for connecting dry contact devices and liquid detection sensors. One female Micro USB connector - reserved for future use. Compatible with any SNMP management software. Operates and configures via HTTP/HTTPS web page. An IP address can be assigned to the E-1W automatically by a DHCP server. Generates SNMP traps, email alerts, syslog messages, and SMS messages (via email-to-SMS). Alerts are posted in event log, which is accessible through Web user interface. Email alerts can be sent to 9 addresses. Users can configure the schedule for when they will be alerted. Supports HTTP REST API to poll sensor data with response in JSON format. WxDxH in: 4x3.65x1.37 (102x93x35 mm). Dual DC power provides dual redundancy. If the first power source fails, the unit will automatically, without interruption, switch over to the second power source. The unit draws power from the source with the highest DC voltage (nominal 5.5V). If both sources have exactly the same voltage, it will draw in part from each of them. 110 to 240 VAC at 50 or 60 Hz via AC adapter. Includes one country-specific AC adapter. The second AC adapter is sold separately (PWR-SPLY-ELC). Built-in Power over Ethernet and dual DC power provides triple redundancy. Power over Ethernet standards supported: IEEE 802.3af, 802.3at. Proprietary schemes such as Cisco Discovery Protocol are not supported. Similar legacy switches and routers will have to use PWR-SPLY-ELC. If two or more sources have exactly the same voltage, it will draw in part from each of them. 110 to 240 VAC at 50 or 60 Hz via AC adapter (not included). Country-specific AC adapters sold separately (PWR-SPLY-ELC). Operating & Storage Temperature: -4 to 167°F (-20 to 75°C). Operating & Storage Relative Humidity: 0 to 90% non-condensing RH. Configuration can be done over the Internet/LAN via Web page. Supports Internet Explorer 6.0 and higher, Firefox 1.5 and higher, Netscape 9, Google Chrome, Safari 1.3 and higher for MAC, and Safari 3.0 and higher for PC. Configure sensor thresholds, alarm methods, formats of alerts, and system data log. View/edit sensors' current values, thresholds and alert statuses. All sensors connected to the E-1W can be viewed on one summary page. User configurable settings allow sensors to return to normal status when alert condition clears, without manually acknowledging/dismissing the alert. View/edit entries stored in the system logs. Event log records system alerts. Stores up to 200 entries. Data log records samples of sensor readings per minute. Stores up to 43,000 entries per sensor. The data log can be downloaded as a comma-separated plain text file. Configure IP information (address, subnet mask, default gateway, DNS, etc. ), user administrative settings, and data logging settings. Up to 9 users can access the web page at one time. Permissions, schedule and alert methods are configurable for each user. Configure up to 32 sensor conditions (alerts). Configure 1 Smart Alert to use different alert combinations to send alert messages. Monitor over the text-based menu system accessible via Telnet. Access is controlled via username/password. System stores encrypted login information. Two user levels: user and administrator. SNMP support, allowing integration into network management platforms. Push configuration changes to multiple connected units in a group at once. E.g. new users, mail server, network settings, security settings, system settings, etc. Choose between Enterprise Management Software or Low-Cost Management Software. E-MNG Enterprise Management Software – use to monitor and configure up to 3,000 E-2D/5D/16D, E-MICRO-T(RHP), E-1W(P), E-SEMS-16(U), IPDU-S4/8 units and all connected sensors. E-MNG-LC Low-Cost Management Software – use to monitor and configure up to 3,000 E-MICRO-T(RHP) and E-1W(P) units and all connected sensors. How to monitor and manage environmental and security conditions over IP. Note: The maximum total cable length for attachment of sensors to the E-1W(P) is 600 feet using minimum 28AWG (4-conductor) cable. This total length includes the cable length of each sensor (maximum 7 feet each) as it extends from the trunk line. E-1W	 Environment Monitoring System with 1-Wire Sensor Interface. One power supply included. 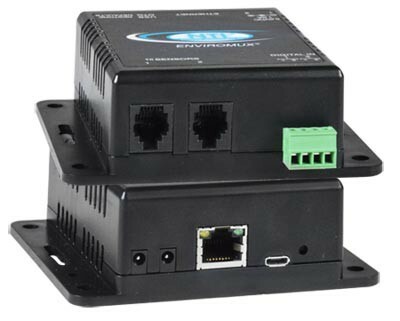 E-1WP	 Environment Monitoring System with 1-Wire Sensor Interface, Power over Ethernet (PoE). Power supply NOT included. PWR-SPLY-ELC	 5.5V, 1.5A Power Supply. Compatible with ENVIROMUX-MICRO & ENVIROMUX-1W.